1. Message text- Optional. Text entered here will appear in the message popup in the SpotWalla.com trip map. 2. Camera- Optional (Bubbler GPS Pro only). Clicking the camera icon will allow you to take a picture that will be automatically uploaded with your message. A small icon of a camera will appear in SpotWalla.com next to messages which have a photo. Once a picture is taken, a small icon of a paperclip will overlay the camera. 3. Categories- The large green circles indicate the category for your message. Food, Fuel, Rest, Sightseeing, Law Enforcement and Bonus/Flag. 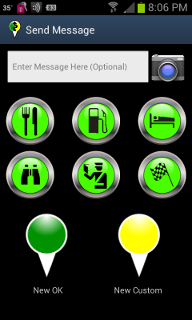 Clicking one of these items will send a message that will be displayed with a white icon in your SpotWalla.com trip. If you have entered text, or taken a picture (Pro version only), these items will also automatically be sent and appear in SpotWalla.com when the icon on the map is clicked. 4. OK/Custom- The green and yellow "balloons" at the bottom work just like the category icons, but will display the traditional green or yellow numbered banners instead of the white icons. Text and pictures will also be sent with these items.